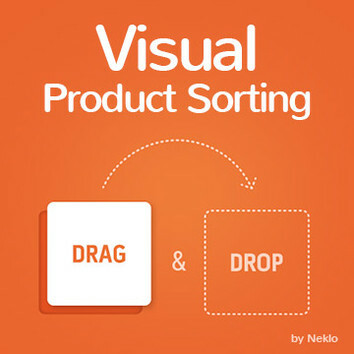 Visual Product Sorting is an extension for Magento 1 that enables custom product sorting in the categories right from the admin panel. You can easily arrange the category contents as you want them to be and draw the attention of your customers to the products that sell well and sell even more. Alongside with search and navigation options, visual sorting plays significant role in product findability. Hardly anyone will scroll multipage category to its very end to check if there is anything worth a look. When customers start browsing categories in an online store, they tend to click the results they see at the top, because it is where the best offers and most popular products are usually displayed. Now you will be able to focus customer attention on the groups of products that substantially contribute to the revenue. All the changes you apply to the order of the products are displayed in your store immediately without the need to save the results. The way you choose to display what you have got to offer on your online store affects the way your customers make their choice. By organizing your product feed specifically you can highlight the goods that deserve more recognition and present your product range in the most favorable and profitable way. Grid configuration of Visual Sorting extension is user-friendly and makes it possible to tune every page according to your priorities and marketing goals. Once the extension is installed, you can see and manage the product placement for every category. Visual Sorting extension displays products with pics and prices in grids by pages as in the store, making it easier to choose what you want to edit and seeing the overall preview for the changes made. 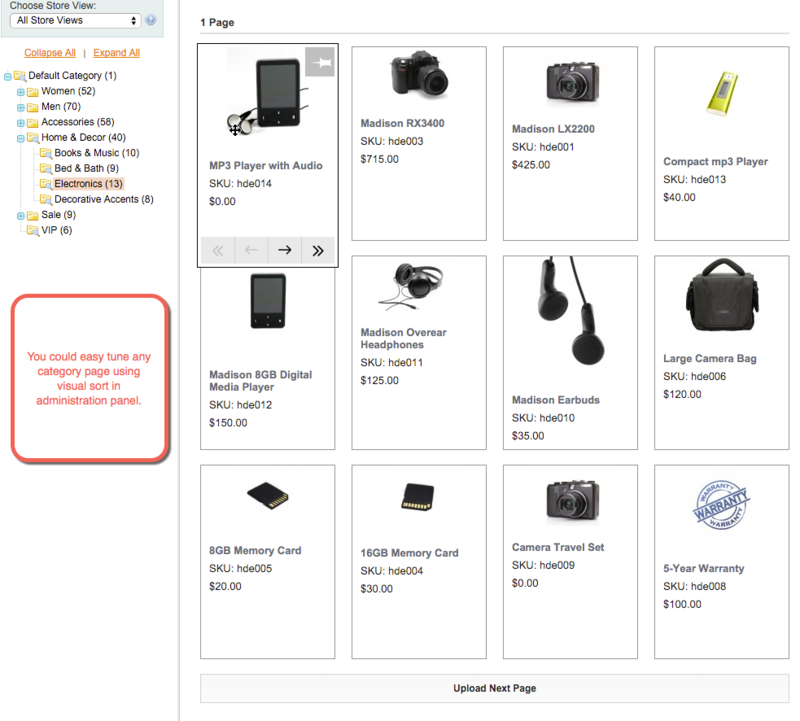 You get to decide which items your customers get to see first once they enter the category. You can promote the items that have already gained your customers’ trust. Showcase bestsellers, most wanted, discounted or any products of your choice on the top of the category page by sorting them in the preferable order. To relocate the product, you can just move it manually to another spot. 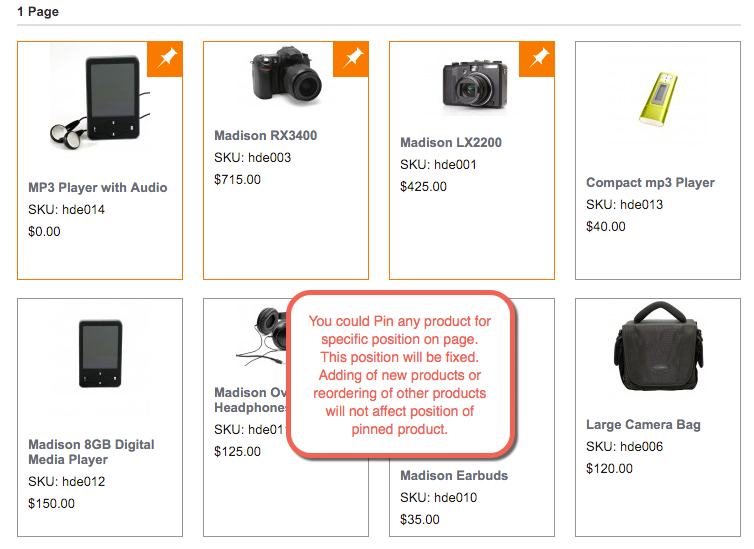 Maintain the product order you need by pinning any product to its place on the page. 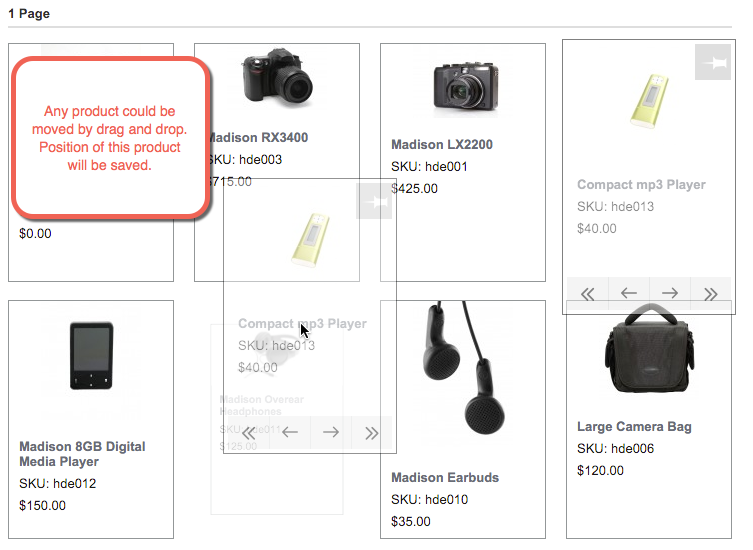 You can make sure that the items that are out of stock won’t pop up as the first ones or new arrivals won’t be at the very last page of the product list. This position will remain fixed, no matter how you change the order for other products and how many new items you may add afterwards. With Visual Sorting extension you can improve customer experience and use product order as a sales booster by offering the range you have got on display in efficient way. Visual product sorting extension is awesome! The plugin adds a comfort and flexibility to porduct management on the grid. I can't stress how easy to sort the products on the store! Looking forward to future updates. Thanks for the quick support provided when I asked a question!